Talks to end a dispute between Southern guards and management have already broken down this morning (Wednesday October 12). The RMT union has already held five strikes this year over rail operator Govia Thameslink Railway’s plans to introduce on-board supervisors, and another three-day walkout started yesterday (Tuesday). Another four strikes are planned between now and Christmas totalling 11 days, but the two sides returned to the negotiating table to try and resolve the dispute this morning, but talks have already broken down. Mick Cash, general secretary at the RMT, said: “RMT entered talks with Charles Horton from Southern Rail this morning in good faith and with every intention of trying to reach an agreement. “However, it became clear right from the outset that Mr Horton is refusing to stick by the assurances he gave to the media yesterday that he can ‘absolutely’ guarantee a second member of staff on all current Southern services with a conductor. “This dispute isn’t about who open and closes the doors, it is about that absolute guarantee of a second safety-competent member of staff on these Southern services. “RMT is angry and frustrated that a golden opportunity to resolve this dispute has been wrecked because Mr Horton has reneged on commitments he has given through the media. Mr Horton, chief executive officer at GTR, said: “Yesterday, the RMT leadership asked to meet with me and I cleared my diary this morning to listen to what they had to say. I made it crystal clear to the union yesterday, once again, that we are moving forward implementing our proposals and any agreement with the union had to be on the basis of these principles. “In the space of a week, we’ve now met twice for face-to-face talks to try and reach agreement but, incredibly, they have absolutely nothing new to say - today, last week, last month - which helps us move forward. They raise everyone’s hopes by stating they want to end the dispute but then dash them by their continued head in the sand position. “In its proposals, Southern has guaranteed that every train which has a conductor today will have a conductor or on board supervisor in the future. However, on trains where the driver has full control of train, if for any reason an on board supervisor is unavailable we want the flexibility to still run the train for the benefit of our passengers. “We are modernising our railway and want the driver operating the train with the guaranteed second member of on-board staff looking after customers, not doors. 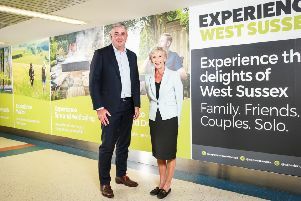 “ My number one priority is to introduce these changes to improve the customer service we give our passengers and, after months of horrendous travel misery, get them where they want to be on our trains, safely and on time.